While negotiations on a compromise on Iran's nuclear projects proceed apace between Washington and Tehran, the war of words has not abated. While negotiations on a compromise on Iran's nuclear projects proceed apace between Washington and Tehran, the Iranians have bellicosely declared that the US must “get out” of the Persian Gulf. The area is Iran's “strategic waters,” and the US does not belong there, Iran said. American and international naval forces are currently conducting a huge exercise in the Gulf and Red Sea. Navies from 44 countries, consisting of 6,500 personnel and 38 warships taking part in a U.S.-led mine countermeasures exercise that has avoided Iranian territorial waters. The exercise is meant as a show of strength, said 5th Feet Commander Vice. Adm. John Miller. “The tremendous number of nations participating in this exercise sends a clear signal that threats to global commerce will not be tolerated." However, Iran said that it would no longer tolerate American forays into the Gulf. According to Iranian Navy chief Rear Admiral Ali Fadavi, who stated that "The destruction of US naval forces is among the objectives [pursued by] the Iranian Navy.” He said that Iran was conducting its own exercises, “simulating this (mission) on a replica aircraft carrier because destroying and drowning American warships have been and will remain on our program." 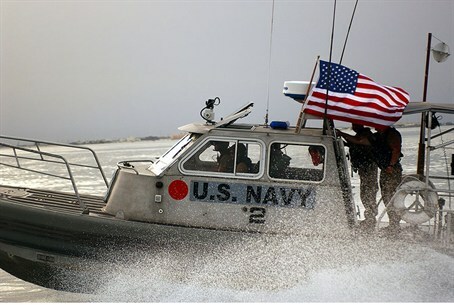 The US Navy's Fifth Fleet, with about 5,000 servicemen, is based in Bahrain’s territorial waters in the Persian Gulf.